For thirty-five years of my professional career I was a very busy flier, traveling around the nation and, occasionally, globally, to pursue my profession and support my family. I started before there were anything like frequent-flier clubs, so I didn't care much what airline I flew then. I packed an OAG in my briefcase in the late 1970s. I don't know if there even is such a thing as an OAG anymore, but the abbreviation is for the Official Airline Guide, a monthly publication listing every flight from every airline, going anywhere. There's probably something like it online these days, but back then before Al Gore's Amazing Internet, it was maybe a 3" by 8" soft-cover bound booklet, listing all the flights anywhere, in an arcane coding system. If you were in Indianapolis and needed to get to Dallas, the OAG would give you all the flights, their times, stops, airlines, aircraft and service available, as long as you could decipher the coding. So yes, I flew a lot, and that was my life and my profession. Once the affinity programs kicked in, I got frequent-flier cards from all the major airlines. But realizing that you needed to focus on one single one to get the best status, I settled on United, which had a hub right there at Washington-Dulles, from where I could get to most all of the places I needed to go. Over those years, I flew over 580,000 miles with United alone, far more than needed to go to the moon and back. Many years I flew with them at the 50,000 mile-per-year level, getting upgraded almost all the time and treated with a measure of respect. Although my flying tapered off in recent years for work, I still looked to United as my main carrier. I have had a lot of good experiences with them, too. My best girl and I went to Hawaii while I had a trade show there that required a small level of my time; the flight over to the islands was an upgraded trip that is a great memory two decades since (and the topic of a previous piece last year). So it was with great sadness that I read last week that United Airlines had no more spine than a jellyfish. Tweaked by one of the activist kids at the high school in Florida where last week's shootings took place, United decided to end its relationship with the NRA, wherein members (as is the case with myriad other organizations) received modest discounts on airfare. No longer will those members, law-abiding firearms owners exercising their Second Amendment rights, be regarded as valuable customers by United. Now, I was an NRA member for almost all my youth, as an avid recreational and competitive target shooter. I joined again decades later for a few years, when I lived where I was doing target shooting with my sons. I am not currently a member, so the actions of the airline do not affect me. But I have utter contempt for spineless wimps, and I am disgusted by a company as big as United making stupid decisions that devalue its own business, influenced by idealistic children with half their brains still uncongealed drool glands. I am flabbergasted that such a company would fail to realize that people vote with their wallets, and they do so without hesitation in a competitive environment ... like airlines. I didn't bother to look to see how many other people have done the same, but I assume there are many who have, and I daresay that few, if any, will decide to fly United because they stopped their program with NRA members. From a business standpoint, it is appalling; and if I held stock in United I would be questioning the sense of keeping it. Their management may sleep better, but only until their Board of Directors starts looking at the lost revenue and scratching their heads. The NRA did not cause, nor did they influence, the Florida shooting. The shooter appears to have had a serious mental issue, whose expression was so clear that both the local sheriff's office and the FBI were alerted. They knew not just that he was a community risk, but that he was at direct risk of being a school shooter, and said he was going to do so. In terms of responsibility, in descending order we find the shooter, the shooter, the shooter, the sheriff's office, the FBI, the deputy who stayed outside while firing was going on, and so on down the line. The NRA is far, far down that list. But tomorrow, if the sheriff there in Broward County wants to get on a United flight, he'll get the discount negotiated by the National Sheriff's Association, to which we assume he belongs, and whom United, along with Hertz (another spineless outfit, that also just lost my business when they dropped their NRA members' discount program) and many others, offers to its members. The sheriff is decidedly more accountable for the deaths in that high school than the NRA. But NRA members lost their discounts, while the sheriff will continue to get lower prices from United. Now, I do not advocate for United to drop its discount for members of the sheriffs' organization, but I also condemn their advocacy in dropping the NRA member discount program. United should have stepped far, far away from making political statements, no matter what some kid from the high school tells them to do. They are an airline. In bowing to mob mentality, they simply empowered the notion that the bully really does have the power. They will lose far more business than they will ever gain by this action. They have been embarrassed as a company and shown to be incompetent to manage the investment of their shareholders. Airlines are a pretty challenging business to be in. The margins are tight, the competition is fierce, and ticking off customers is a pretty stupid practice. But hey, it's their choice. And I have a choice, too. Bye, bye, United. Fly safe without me. This is a rather difficult piece to write, if only because if you are interested in the sport of curling you know it already, and if you don't, but want to absorb the moral of the story, you have to be sufficiently not turned off by the fact that it is about, well, curling. I did actually write about the sport already in the first week of the just-concluded Winter Olympics (here), but it was to excoriate the media for placing themselves above the competitors in importance ("Why didn't Matt Hamilton kiss the ring of The Katie Couric? "), not to discuss the competition itself. Once the mixed doubles completed, the men's and women's four-man teams, the more familiar structure to us quadrennial followers, began. The men's competition consists of ten teams with a round-robin format where each team plays all the others. The best four records go into a medal round, #1 plays #4, #2 plays #3, and the two winners play for the gold medal. After six games of the round-robin, Team USA was 2-4 and virtually out of it. Unfortunately this raised further groaning in the USA curling community and among fans about the "skip", or captain, John Shuster. Although he had been on the Olympic bronze-medal USA team in 2006, his performance in 2010 and 2014 had been disastrous, missing key shots and his teams not getting close to the medal round. After 2014, many assumed he would not be the skip for the 2018 team, and a "new generation" of curling talent would be recruited. To make the 2018 Games, Shuster got in better physical condition, and would have to compete in the Olympic Trials. There, while it was a hard road to win the right to take his team to PyeongChang, he did indeed win the Trials with his team and would skip for the USA in 2018. I did not know any of that background. Although my best girl and I watch curling religiously during the Olympics, it is very much constrained to the Olympics. So we only watch every four years, and our love for the sport goes dormant between Olympics. 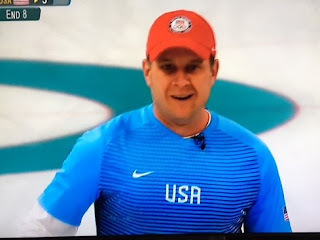 But we knew who John Shuster was, and I will say that when we started watching the men's team event and saw that Shuster was the skip, we were not thrilled to see him there. After the 2-4 start, we thought it was 2010 and 2014 all over again. We're just a couple in our 60s who watch curling for the Olympics. Surely the people in the actual community of the sport were livid, or at least as livid as upper midwesterners get, seeing failure again -- and surely blaming Shuster for again not living up to what they thought USA curling should be. Needing to win three straight to have even a chance to make the medal round, Shuster and Team USA flipped on a switch and won all three. This included a shocking win over Canada, where the sport is all over and at the next level after hockey (of course). More importantly, when it came down to the last shots of an "end" (the "innings" of curling), Shuster's touch turned magical in those last three games, and shot after shot of his hit its target for vital points. His touch continued through a semifinal win, a second one over Canada that guaranteed at least a silver medal and a finals match against Team Sweden. By this time, John Shuster was no longer the pariah to casual curling fans (Aside -- in our house, the phrase directed to the TV was "Who are you and what have you done with John Shuster?"). His reputation might have been redeemed to this point, surely if he could at least make the gold-medal match close enough to be respectable. John Shuster seems to be a good guy, a typical upper midwesterner not given to great outbursts of emotion and much like, for the most part, his teammates John Landsteiner and Tyler George (Matt Hamilton, the fourth, is a bit more animated). You'd want to have a beer with Shuster, but after two you'd probably tell him he was terrible in 2014 and 2010. I love a redemption story, and this was already one after seven ends of the gold-medal match with Sweden, with the teams tied 5-5. We had taped the match, recorded at 3:00am Saturday, and were watching diligently with coffee first thing that morning, not knowing the outcome yet. Team USA, playing the yellow stones, had four of its stones in the scoring area in the eighth end, but the Swedish skip's final shot had put their red stone closest to the center, where it would score. Shuster, with the very last shot of the end, had to thread a shot through two others to get to the scoring area (the "house") to try to knock that closest red stone out of the house so the USA would score. If the USA could knock out both of the red stones, though, it could have as many as five scoring stones still in the house and, with the end over, a five-point lead that would be impossible to overcome. What you see at right is the redemption of John Shuster. 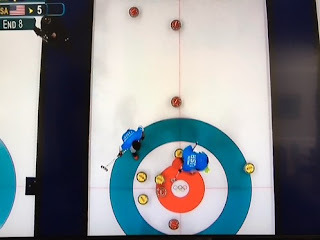 The yellow stone in the red circle is actually in motion; it is Shuster's last shot, which a moment later struck the Swedes' scoring stone and would knock both it and the other red stone completely out of the house, leaving Team USA with a five for the end and, as curling works, a lock on the game -- and the gold medal. Sweden scored two in the ninth, but conceded the gold with two shots to go in the tenth and no possibility of winning. At left is the look on John Shuster's face as that shot in the eighth end is just completed -- amazement, satisfaction, triumph, all rolled into one. It looks like what a guy from Minnesota looks like when you tell him he just won a million dollars; in this case it is what a guy born in Minnesota looks like when his career has been redeemed by his own performance, in the situation a curler can only dream of having his career lead to. It's not a lot of outward expression, but there was surely a lot going on inside. There was perhaps a fairly subdued, redemptive expression on Shuster's face, but I can assure you that it was not a subdued group of Americans in the stands of that arena in PyeongChang, absolutely ecstatic at the shot and the imminent success of the American team, hugging, raising fists and screaming. I can assure you that there were those in that group who had not had the greatest confidence in Shuster prior to the mid-course turnaround in the seventh game of the round robin. I can assure you that in this house, there had been almost no confidence in him prior to that game. 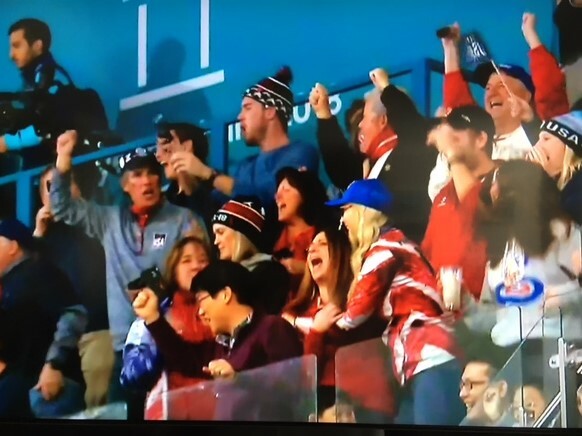 But like the Americans in the stands celebrating in the picture, and the screaming multitudes in the Duluth Curling Club, Shuster's home, it was an exciting day for this household. I was ecstatic for Team USA, but as I said earlier, I love a good redemption story, and I could not have been happier that this team was skipped by someone who had known bitter defeat in two previous Olympics. The closing ceremonies are behind us; the lackluster performance of the American figure skaters, the sport we all wait for in the Winter Olympics, helped depress the TV ratings to where the NBC people will have to end up refunding money to their advertisers. They couldn't deliver the eyeballs (of course, perhaps others got tired of the pompous Katie Couric types and the fawning attention paid to gay and minority athletes, instead of just letting them be athletes and try their best without having to be symbols. John Shuster, gold medal intact, will go home to Duluth and forever will be an Olympic Champion. He will forever remember the memory of standing on the podium with his teammates, and being introduced as "Gold Medalist and Olympic Champion"; putting hand over heart and singing (as did all his teammates) our national anthem. We will remember him saying how proud he was that he "became the skip his teammates deserved." He will forever remember The Shot. If he forgets it, he can just give me a call, as I still have the game on DVR and I'm going to make sure I can get it on YouTube before I would dare erase it. I've watched that shot five times since, and I can tell you that when I watch it, I think less about the skill that it took, and far more about what it meant to the man who delivered it. Congratulations, John Shuster. You have taught your nation a lesson. This past Friday, President Trump made a pretty long and well-received speech to the Conservative Political Action Conference (CPAC) at their annual meeting in National Harbor, MD. I'm sure you heard it; I did, and there was a lot of interesting content. President Trump is nothing if not a different kind of speaker. But that was not what I noted for Friday, as far as his speaking. On his way over from the White House to National Harbor, as he was leaving to head there to speak, there was a brief impromptu exchange with reporters. The content of their questions was mostly in regard to gun control, but it isn't so much the content that mattered. It was that it happened at all, and how, and with what attitude. As brief as it was, there were a few questions when the press corps started calling out to the president and he stopped and replied. He did not look rushed, and he appeared to be wanting to give thoughtful answers, which I felt that he did. It absolutely struck me at the time that this exchange seemed unusual, not for this president, who does it repeatedly but for presidents of many years. I can't recall Barack Obama, who promised to be His Royal Transparency, ever giving much unscheduled press time like that, and if he did, it ended up being a lecture. That's, of course, the typical liberal approach to questions; answering something other than was asked and going on for a long time. Hillary Clinton raised that non-answer to an art form. Donald Trump appears to answer questions of reporters as president exactly as he would have while a civilian businessman. Here's the answer, here is "what", here is "why." If he only has two minutes, he'll hang out for three, to take another question. At this stage of his presidency, he appears to have something to say about most all of what he is asked. Well, I tend to think that it has to do with the sincerity of the answers, that they tend to reflect the actual beliefs of the man. President Trump answers X, Y and Z because he believes that the solution to the problem is X, Y and Z. He is not being deceptive; his real motivation is not some hidden agenda of money or power, but to solve the problems he was elected to solve with the solutions he said he was going to use. Democrat leaders, on the other hand, are in a different position. Their "solutions" don't work, since liberalism doesn't work anywhere (and certainly not here). So their thirst for power is for power's sake, not to solve the problems -- otherwise, they would have actually addressed immigration, gun control and the like when they had the power, more, in fact, than the Republicans have now with their thin Senate margin. Instead, they went after health insurance in a way that didn't solve the health insurance problem but simply added a lot more government. President Trump appears only motivated to address and solve problems; he is already wealthy and powerful. As I wrote recently, he has the businessman's approach that says to do it better, cheaper, faster. He will feel successful as president if he can accomplish things for our country and our people, not if like thinkers are elected to office just for power's sake. And so it seems comfortable now for him to take questions informally and unscheduled, because he can speak sincerely about the issues and solutions. Since he is interested in the issue more than just power, he is open to having those solutions changed if the argument is there. The left cannot do that -- they can speak to the press but not really answer questions, although the press is typically their ally and the questions are softballs. They seek power, not solutions; more government and more tenure, not a better life for the people of the USA. President Trump said a lot of good things at CPAC. But the few minutes before leaving the White House, chatting with reporters, said equally as much, if we chose to listen. It's Friday again, and time to mention something that is almost completely irrelevant to the rest of the world, but is such fun to write about. I was 65 years old before I lived anywhere where I had cable television, as I wrote about last year in a related piece. That may sound a bit strange, but I spent most of my adult life living in what can politely be called a rural area, in the mountains and foothills of the Blue Ridge Mountains in Virginia. For an awfully long time, that meant that we had television, but it was over-the-air stuff, what you could pull in with a big antenna on your roof. We did that, not out of frugality but because the nature of cable TV is that it requires a signal to be brought to your home by an actual cable. If the number of users per square mile is too low, it becomes unaffordable for a cable provider to serve the area, and the inhabitants put up big roof antennas. In the early-mid 1990s, however, the first satellite-dish companies started installing their services, led by DirecTV (long before they became part of AT&T). The benefit there was that no physical cable connection was necessary; as long as there were an unobstructed view of the part of the sky where the satellites were, you could watch not only the local network stations but anything that you could get on cable systems that was broadcast to a satellite. My best girl and I were "early adopters", installing such a dish in 1995. DirecTV has tens of millions of subscribers, so it would be funny to place a customer service call to them for whatever, and have them look at our six-digit customer number. There weren't a lot of those left, and it was a hoot to have the tech who was on the phone point out that he or she was six years old when we got our account with DirecTV, meaning that the tech had effectively grown up with universal cable/satellite access. We had only antenna service when we got the satellite dish, so I had never had cable service to that point, and the 21 years we had the DirecTV account. But during that time, I had many opportunities to have to call customer service for a variety of utilities and services, and lots of instances of having frustrating conversations with well-meaning people in India and the Philippines, trying to answer my questions from a script they may or may not have actually understood. And always repeating my problem back to me, as if I didn't understand what I had asked. Nothing has probably caused more hard feelings toward South Asian people, whom I otherwise certainly have no issue with, than call centers. There is an accent that I think is the result of young Filipino women in call centers being trained to try to Americanize their accents. When I hear that on the phone I'm ready to hang up. I had a call a year ago where I was trying to adjust my SiriusXM radio service to add a home receiver to the account of the radio in my car. I spent 45 minutes on the phone with this one girl somewhere in Call Center Asia, and could not get an answer to what should have been an easy request. I literally had three separate replacement receivers shipped to my home in the subsequent two weeks, although my receiver was not broken and didn't need replacement. At the time, we were building a new home, and had to choose a cable provider because DirecTV was not going to be a workable option here (nothing bad about them). In the condo we were staying in during construction, at the same time I had that lovely unproductive exchange with the SiriusXM person, we had Time-Warner cable service. That was February 2017, literally the first time I had ever had cable in my home, even a temporary home like that condo. Although the cable account was in the owners' names, we did have to call the company on a few occasion. Time-Warner's customer service was located down the street, one would assume, from where SiriusXM's was, because it sounded like the same girl with the same questions -- and the same result, or frustrating non-result. So in our new house we decided to take a risk and go with the other available option, a local cable company that operates in the coastal Carolinas, headquartered right in the county we live in. They do only fiber-optic lines and very modern technology. They were also willing and able to send a guy over to the construction site and tell us what we needed to arrange for, so as to have the services we wanted (TV, phone, Internet) designed into the build. Friendly guy, local and working directly for the company. The service was installed a couple days after we moved in, and naturally we had some follow-up service calls to tweak the service accordingly. Each time, the service call was answered in their call center, which is located at their headquarters facility 14 miles down the road from us. The person was helpful, informed, understood what I was asking without having to repeat the question, and possessed of an accent local to this area. In other words, it was what customer service should be. I happened to have called them yesterday to arrange for the baseball package for this season, and once again spoke to a pleasant and understandable voice, who totally understood what I needed and quickly arranged for it. I almost wanted to stay on the phone just so that I could accumulate more good stories for friends back in Virginia (with global cable call centers) to envy, but that would be selfish. I'm lucky to have cable TV service, but I'm a lot luckier to live where I can actually call their service line without trepidation or risking hypertension. This is a small coastal town with its own virtues, but sometimes I feel the luckiest for having a cable company with local phone customer service. President Trump is a different fellow. We could count the many ways that statement is true, but for today let's concentrate on one, the one that actually matters. Do you recall all the time that we referred to him in the 2016 campaign as a "businessman", and talked (and I wrote) about the implication of that? Well, we generally referred to his business background in the sense of balancing budgets, getting projects done ahead of time and under budget -- that sort of thing. And to be honest, that's been the case. Starting from negotiating with Lockheed Martin to get the cost down on Air Force One renovation, to the way the border wall is being pursued, all of that reflects a concern for taxpayer dollars that aligns with what a successful businessman would do. But what I really want to focus on is the business notion of getting things done. That's incredibly relevant, because Washington does not get anything done, ever, and has the "deep state" or "swamp" culture of not getting things done. It's ingrained in them; they send things to committees, they pass continuing resolutions to fund government without a true budget, and nothing changes. That is anathema to President Trump. He detests when people do their jobs perfunctorily, just to survive in their jobs, and not to, you know, accomplish anything. I get it; I hate that too, and especially when our elected leaders do that, the ones we pay. But that is the swamp for you. He measures success by accomplishment, not by continuity or tenure. He is also not an ideologue. He is a conservative, I think, certainly in the fiscal sense and in global affairs, so that would say he is "conservative" there. But he is also a social moderate in the sense of his tolerance of differing points of view on issues like religion, gay rights and that sort of thing. And, very possibly, firearms legislation. It has been the normal process in the past, after a mass shooting, that people have pointed fingers for weeks, the event is mostly forgotten, ultimately, and nothing has gotten done. That makes perfect sense in the recent climate, because Democrats don't actually want to do anything that might remove a talking point for them, and Republicans don't want to do anything that isn't going to work. Now, I have to concede that, as a past NRA member, my views were formed long ago. But they are fairly moderate for an NRA member, I think. First and foremost, I oppose any legislation that will not achieve its desired end based on history (e.g., any law on the books in Chicago). The desired end, of course, should be to keep firearms out of the hands of people who can be expected to use them in a felonious way. So I am fine with tight background checks for purchase, as long as there is a very short time limit for the government, whatever government we are talking about, to approve or reject them, and a reasonable appeal process. That would reasonably be expected to help keep firearms out of the hands of some people who shouldn't have them. As long as our data on criminals and mentally uncertain individuals is current enough to turn those decisions around quickly, I can work with you. I'm certainly OK with illegalizing bump stocks, and can easily be convinced that magazines above a certain count should not be sold. Such notions are certainly consistent with the Second Amendment rights of Americans. We have already banned fully automatic weapons, so there is at least some precedent. And President Trump seemingly could get on board with such things. More importantly, they could become law in his administration, if Congress were willing to stop deflecting and actually consider legislation. And what, my friends, would happen if they did, under this president's leadership? From a political standpoint, and I have to stress that I hate to make it political, this is a tremendous opportunity for President Trump. After all, the Democrats held the White House and both houses of Congress with a filibuster-proof majority in the Senate for two years, and did nothing about firearms legislation (or immigration, or infrastructure, or ...). Nothing! They could have done anything they wanted, which can only lead you to the conclusion that they didn't want to fix the problem. So suppose that President Trump proposes, and Speaker Ryan and Leader McConnell go along with, a bill that includes tighter background checks to weed out criminals, metal misfits, illegal aliens, etc., guaranteeing a quick turn on rulings; that includes a ban on bump stocks; and limits magazine sizes. Something like that. Suppose it goes to the floor and Congress actually votes on it. All of those are things that Democrats have wanted, at least when they talk (which is all they do, of course). How do they not vote for such a bill? How do most Republicans not vote for such a bill, which would address the concerns they have, would be expected to do at least some weeding out of people who shouldn't have a gun, and prevent some guns from becoming WMDs -- and would be an actual step taken? Such a law would not hurt, and might do some good -- OK, I'm not sure it would, and since it would be preventative, we'd never actually be sure what it had accomplished -- but it would be reasonable and popular. Congress would have been seen as doing "common sense" legislation for once, and could not be accused of not having done anything "common sense." More importantly, President Trump, who very likely supports all those things, would be properly seen as having led the debate and having gotten something done, which no president before him had. It would be a dramatic win for him and for the Republican approach to governing. The Democrats would want to fight hard, because they cannot afford to let President Trump win on anything after their disastrous loss on the tax-cut bill and the bonus aftermath. But what are they opposing? The things they're saying we have to have now, they'd be in the bill! The Democrats would either have to vote for it, which would not only make this president look like a consensus-builder but a leader, or they could oppose it, and flood the media with idiocy like they did with the "crumbs" disaster. Gun control legislation is actually a winner for this president and this Congress. They can do it and they need to, especially in a tight, well-structured piece of legislation. Heck, even I could write that kind of law, and Congress could pass it. Imagine the 2018 campaign if they do. OK, so Monday I go to all the trouble of writing about the curious case of J.D. Martinez, the former Astros, Tigers and recently, a bit briefly, Diamondbacks outfielder. Mr. Martinez, an excellent power hitter and glove-challenged outfielder, had lain dormant in the free agent market of the 2017-18 offseason, with only one team offering him a contract -- the Boston Red Sox, the only team in the majors with both a need for a player of his imbalanced skills and the wherewithal to pay him to provide them, in uniform. The problem, of course, is that his contract offer was just over half of what his agent had declared for many weeks was his "market value." The Red Sox, of course, saw his market value as being about $110 million for five years, and saw no reason to raise their offer, not since they made it at the beginning of the offseason, since no one else was offering a penny more -- or anything close. My point was that markets set values on the demand side, and the supply side -- in this case the player and his agent -- could not expect to overcome a limited demand. One team could afford him, at what they felt was a reasonable price, and ultimately they "won." Monday night, Martinez agreed to terms with Boston on essentially the offer they had made all along, with a tweak here and there to take into account opt-out clauses along the way -- which Boston was only too willing to provide a player in his 30s. I find this to be a victory for common sense. It's not a victory for the team owners, because that's not a competition they really ought to be in. It is a victory for reasonable player compensation, and a defeat for further agents who toss out numbers for teams to start at in wooing their clients, with no rational basis. It is a victory for the common sense that notes that the road of free agency is paved -- nay, littered -- with the putrid outcomes of huge long-term contracts for once-great players, stars such as Albert Pujols, Alex Rodriguez, Kevin Brown, Carl Crawford, Pablo Sandoval, Mark Teixeira, Hanley Ramirez ... need I go on? We can point to one such free-agent contract wherein the player was suitably productive all through it, and that one, for Manny Ramirez, ended rather turbulently amid PED allegations and bizarre behavior -- but at least the guy kept hitting. The practically-invariable outcome of such contracts has been abysmal failure. The players give the team three good years followed by highly-paid poor performance for 3-4 years more. At some point, the valuation for rotten apples has to descend to the true value of apples that rot while you're chewing on them. I certainly hope that Martinez is a productive player for all five of those years and leads the Red Sox to multiple pennants and world championships. I hope as much, well, nearly as much, that he will at least enjoy his time in Boston with the Red Sox and that the sour taste of the negotiations fades early in spring training. I hope, in fact, that there is no sour taste, because if Martinez should be upset with anyone, it is not Boston, which actually offered him a ton of money to play for them, but the other 29 teams who, you know, didn't. This is a victory, and I truly wonder what subsequent contract negotiations for similarly situated players will look like. We won't see that this year, because only Jake Arrieta, an older pitcher but with residual talent, remains as a "premium" free agent, and he may be signed before this is even published. But I want to revisit this piece in a few months, and a year or so, and see if there is something earth-shaking about this contract. With the announcement of the findings of the Mueller investigation, the whole perspective we have on the issue of Russia and the 2016 election appears to have changed. A dozen or so Russians, who will never be extradited from Russia to be brought to trial here, were charged with whatever the obscure laws governing foreign interference in elections cover. Of course, there is some kind of report with the charge filing, and that provides some indication as to what the Mueller team believes they found that Russians did. And those charges have some pretty interesting content in them that makes us think a bit. The Russians have been tampering with our election process for decades; we always knew that. This effort and investigation actually forced our government for once to dig hard into what the Russians were doing, as opposed to telling them to "cut it out" (B. Obama, 2016) got some concrete material on when, as well as what, they were doing. So let's note one prominent point. The evidence that the Special Counsel's team uncovered, about their actions in the 2016 election, indicate a continuous effort going back to at least 2014. Since Donald Trump didn't come down that Trump Tower escalator to declare for the presidency until June 2015, it does sort of blow up the notion that there was any particular collusion between the Russians and the Trump campaign. The report, of course, indicates very strongly that the Russian actions were absolutely not on behalf of a single party or candidate. They were balanced, intended to produce more contention between the parties and between candidates, more extreme hostility and, in general, try to make democracy as practiced in America look unattractive. That's what they did, and that's why they did it. So let us look at a few points in time. In 2012, Barack Obama, then president and running for reelection, whispered over an open mic to Dmitry Medvedev to "Tell Vladimir [Putin]" that he would have more flexibility after the reelection campaign, and that Putin should give him "space." During that same 2012 campaign, we were in one of the presidential debates with Mitt Romney. Noting that Romney had called Russia our greatest geopolitical foe, Obama used the cutesy line, written for him to stuff in when the time was right, "The 1980s called and they want their foreign policy back." In other words, on a huge stage, Obama, then the actual president, soft-pedaled any notion that Russia was a serious geopolitical adversary. Then in 2014, the Russians who, in Obama's view, were not our big adversary, started (or updated) a campaign to sow discord in America by exacerbating the rhetoric and the contention on both sides, which they continued even after the election. One can imagine that if the Russians somehow did not start, or fund Antifa, that they are at least quite supportive of an anarchic organization that fits their mission just fine, thanks. So Obama says the Russians are not a big deal. He whispers to them that he'll be more flexible after the election in 2012. The Russians then foment all kinds of fake disguised-as-American garbage to stir up political animosity on both sides. Obama knew that was going on, because Loretta Lynch's Department of "Justice" knew about it. But nothing got done to stop it, and now somehow the Democrats are all uptight because they want President Trump to implement sanctions and probably invade Russia. So why does Barack Obama have to be protected? He obviously knew at least some of what was going on, but did not bring it to the attention of the American people, save telling Putin to "cut it out." He even made a point late in the 2016 campaign that Donald Trump should stop complaining about a rigged election! Is that not something that we should be asking about Obama before, you know, we start naming schools and mountains after him? Obama is an extreme leftist, and leftists are not big fans of the will of the people, except the ones who keep voting for them to expand government. Is it not possible that Obama was doing the "wink, wink" thing while the Russians were setting up shop over here specifically for the purpose of wreaking havoc on the normal electoral process? Let's face it, problems -- any problems -- are good for the Obamas of the world, because they create an appearance of a need for more government, more oversight, more clamping down on all but the privileged class. Motivation is all over this, especially if Obama's fingerprints could have been wiped clean, which would have happened had Hillary Clinton been elected. Let's hold Barack Obama suitably accountable for the destabilization of the USA and our election system, and working with foreign entities to allow them to do so. If ever there were a piece that might be overcome by events before it is published, this is the one. I'm writing this (yesterday), and as I write it spring training has started for pitchers and catchers, along with some position players who can't wait to get the new season going. I am a fan of the Boston Red Sox, an aberration since I am not a New Englander of any stripe, but they have been my team since the mid-1950s While no one can explain such geographically-misplaced fandom, it is what it is. So I am waiting with bated breath to see who becomes the 2018 employer of J.D. Martinez (update ... still waiting). Martinez is an outfielder who played mostly for the Detroit Tigers until the middle of last year, when he was traded to Arizona, before reaching free agency in October. The Diamondbacks would probably like to keep him, and he probably would like to sign there, except for a couple things. For one, he is an excellent hitter who has gotten better his past couple years, but his fielding is pretty poor. His skill set would fit well as a DH, except 45 years later the National League still does not have a DH, meaning that he would have to play the outfield regularly for Arizona, and that would be dangerous. For another, DH is not only an American League-specific job, there is really only one AL team that has a need for a highly-paid DH, and that is the Boston Red Sox. So wherever Martinez may want to work, there is only one job out there at whatever the maximum salary might be, and that is in Boston. Martinez's agent, Scott Boras, way back in the fall announced that the market price for his client's services would be seven years and $200 million. That would be the price, based on Boras's crunching of the numbers to determine his value, at least based on previous contracts for "comparable" players. Sure, except simple supply and demand laws apply, and previous contracts, issued by different employers, don't. If the best (or only) fit is with one team, what they are willing to offer becomes the market value for the player's services, not what he wants to be paid. No one who needs him less will pay him more, obviously. And Boston has already made him an offer, in the range of five years (guaranteed, mind you) for $110-120 million or so. Now let's put that into perspective for just a second. When the Powerball jackpot gets to $110 million, people all over the country dump unneeded dollars into lottery tickets. I make a decent living, but I will only see a tiny percentage of that amount over my entire career. Boston has offered that, guaranteed. And no one else has come close. So while spring training is several days in already, J.D. Martinez remains unemployed, albeit with a lucrative offer on the table. That he has not accepted it is curious. Boras's contention that he is worth $200 million, of course, is based on a market he describes -- that does not exist. There is Boston, but Boston has said that $110-120 million, whatever they offered, is what he is worth to them. If he is worth $200 million to someone, more power to them (and to him), but Boston has stated a value, and they have apparently not come off it since it was first presented. And why should they? No one else is bidding them higher. Have you ever seen an auction where the person already with the high bid decides to offer more? I haven't either. He is only worth $200 million if someone is willing to pay $200 million. A cup of coffee is only worth what people are willing to pay -- I'll pay 45-55 cents per K-cup for a box of ones of a flavor I like, but they're not worth 80 cents to me, and I won't spend that. J.D. Martinez is worth $110-120 million to Boston, and they don't see why, if no one else is bidding close to them, they should raise an already generous offer. Only they have a need for what he does, and they have put a value on a contract based on the need and what they can afford. If he does not accept their offer, Hanley Ramirez, a competent major-league hitter, will be the main DH. Bryce Brentz, who hit 31 homers for the Red Sox AAA team last year, is on the roster and could also DH; like Martinez, Ramirez and Eduardo Nunez, whom the Red Sox just signed, he is a right-handed hitter (they prefer right-hand hitters whose names end in "Z", even if they're German). That's why Martinez is worth what he is worth to Boston. Every other AL team has someone to DH or, more often, they simply use their DH slot as a "rest" day for a position player. J.D. Martinez has far less value to those teams, little more than he would have for an NL team that would have to put his poor glove in the outfield. Without even getting into the disasters that the vast majority of long-term, nine-figure contracts for players in their 30s have become (q.v. this piece on Albert Pujols), we have to ask what good Scott Boras has done for J.D. Martinez, his client. Boras totally misread the market, as evidenced by the fact that his client is unemployed as this is written. By waving around "$200 million", he immediately killed most of the market for his client. Why? Two reasons. First, of course, maybe half of all teams can commit that kind of salary budget to one player, so they're immediately out. Then, and as importantly, would you want a player on your team who felt he had to sign a contract for half what he was "worth"? What kind of morale would that engender? It's astonishing that Boston would do that, except for the fact that -- wait for it -- they alone had a need for the player. If only they have the need, then only they, not the agent, set the price. They have set it and stuck to it, because they are not so silly as to bid against themselves. At this point, with the player still unsigned and doubtlessly mad at someone, I'm not sure that I would be really happy with him on my team. But I'll tell you what. I'm a "free agent" too, as an independent contractor. The firms that arrange for my services with clients tell me what they're going to pay. I have a basic consulting rate, but for the most part, I take what I am offered, because that's what I'm worth to the client. I think I'm pretty good at my job, but my worth is what the clients think I'm worth, so I take it. And I am busy full time, in contrast to J.D. Martinez. Who's Running the Baseball Asylum? Last football season, one of the NFL owners made a big stink by referencing a phrase that most of the players had never heard before. We have long used the allusion, "The inmates are running the asylum" to mean that people -- employees, students, whatever -- were acting as if they were in charge, even though they were not the owners, or the bosses, or the teachers or principals or whatever. We grew up hearing that phrase on occasion and have always known what it was supposed to mean. Apparently, however, you may no longer ever, ever use the term "inmates", even in an aphorism, to refer to NFL players. I guess it is because they are so disproportionately black, as are our prison inmate populations. Yeah, that's it. Got to be. Of course, the phrase refers to mental institution inmates, not prison inmates, but the facts are never allowed to get in the way, when the left is doing the arguing. So the owner was forced to apologize, though for what we are none of us sure. So ... in this nascent baseball season, there was a piece out there yesterday regarding the New York Yankees. As you know, after last season they were gifted the slugging outfielder Giancarlo Stanton in a trade from the Miami Marlins, newly part-owned by the Yankees' former shortstop, Derek "I'll Always Be a Yankee" Jeter. The trade was so lopsided -- Miami received a second-baseman, a batboy and a bag of game-used baseballs -- that the Marlins fans revolted ... both of them. At any rate, this piece pointed out that when the trade was about to be completed, Brian Cashman called Aaron Judge to ask him if it was OK. Now, Brian Cashman is the long-time General Manager of the Yankees. That is not a position we take lightly, given that the Yankees have a fan base somewhat larger than that of the Marlins and consisting, to a great deal, of rabid, entitled New Yorkers who think think that the World Series is their birthright. Aside -- I have friends who are Yankee fans. Let's just say that I have managed to befriend only gentle, kind people, who happen to be Yankee fans through no fault of their own and don't fit that stereotype at all. Right, Big Tony? So it is tough to be the GM of the Yankees, and that used to mean that there were only tough men serving that role. Ed Barrow. George Weiss. Roy Hamey. You would not want to negotiate a contract with Roy Hamey or George Weiss or Ed Barrow. I read a lot of baseball history; trust me, you would not. Brian Cashman apparently is not George Weiss. Aaron Judge, whom he felt obliged to consult on the trade for Stanton, had a really good year last year -- but it was his rookie year, his first full year in the major leagues. I don't care if he had hit 500 homers; he was a rookie! On what planet is a GM, particularly a Yankee GM, asking players if he should execute a trade? George Weiss wouldn't have asked Mickey Mantle for advice on a trade, let alone if he thought it was a good idea or not! What has changed to where a GM is actually asking players what they think? Now, I will grant that it is a different era from the 1950s and the days of Weiss and Barrow and the like. I will even grant that, as a GM, I might ask a player about a former teammate, what kind of guy he might be. I might do that, because in these lovely social media days, and in these days when free agency has moved players from team to team a lot more than in years past, more players know each other and clubhouse morale can affect performance even more than before. But I'll be gosh-darned if I think it is a good idea for a GM to ask a rookie for trade advice, even if he had just hit a bunch of home runs and the team had roped off a special section for his oh-so-special fans. The GM has a lot to concern himself with -- particularly managing a salary budget, given that players can conceivably become free agents after six years, are winning large awards in arbitration, and staying under a luxury-tax cap that costs a lot to exceed repeatedly. I'm probably a bit old-school in this. I don't think baseball was such a great thing in the old days, when players had to take what was offered them or not play, and were restricted to only the team that owned their services in perpetuity. I don't admire those old GMs; they weren't the greatest people for the most part, and they certainly ran a hard line. But they were the ones, along with the owners, with the money on the line. The risks were theirs, because the investment was theirs, and/or the job of managing that investment was theirs. My old-school nature tells me that the involvement of the players in personnel decisions should be limited, private, and of a very narrow focus. Asking a rookie if he would be OK changing positions if the team pulls off a trade for a veteran just smells like something. Like, I guess, the inmates running the asylum. This may or may not be the day to do a brief piece more suitable for a Friday column, but I can't really say much about the news event of the morning the shooting in Florida, except that cooler heads will likely not prevail, and we will have a plethora of commentary focusing on one aspect of the case and ignoring the rest. Me? I figure if we couldn't do something in advance about someone who practically declared to the world he would do this, well, I've no idea where we go. Today was actually "inspired" (and I use the term correctly) to write, by a can of olives. Yes, I was. I was in our local Lowe's when this happened. Now, this is probably not the Lowe's you think, the hardware store. That Lowe's is all over the country, and wherever you live, if you don't get your light bulbs and screwdrivers at Home Depot, you get them at Lowe's. In the Carolinas, however, mostly east of Charlotte and north of Charleston, there is a large grocery chain that is also named "Lowe's", with no connection. In the small town where we live, for example, there is one hardware Lowe's and two grocery Lowe's. As you might guess, though, we have developed a verbal shorthand to distinguish them. We refer to them as "Boys Lowe's" and "Girls Lowe's". Take that, political correctness. At any rate, the label on this can of olives had on it the inscription, "Inspired by Italian chefs." Now, you know I am as likely as the next guy to stop and look carefully at something we are not meant to stop and look carefully at. So I had to ask myself what, exactly, that was supposed to mean. This was a can of olives, black pitted olives. You make a can of olives by taking olives and putting them in a can. No Italian chefs involved, just Marco and Giuseppe taking the olives off a tree, the olives going to a packing plant and going in a can. Maybe the pits are removed by a machine. No chefs. What were we even subconsciously supposed to infer from that line, "Inspired by Italian chefs"? That somehow the olives were gently put in the can the way Chef Boy-ar-dee would have done if he were supervising the packing process? I don't know. But it did get me thinking. There is a brand of toothbrush out there, or maybe toothpaste, that runs TV commercials with a smiling voice-over adding the line "Inspired by dentists!" to the rest of the ad copy. That one has always struck me. Which dentists, exactly, inspired that toothbrush? Most of us don't exactly associate dentists with anything positive; in fact, if my dentist inspired me to do anything, it would be to floss and brush so I never have to see him. What does "inspired" even mean, exactly? If a company decided to make a toothbrush, would they not first research what makes a good toothbrush? How is one brand of toothbrush inspired any differently from another, all of whose inventors researched dental hygiene studies from, you know, dentists. You know what was "inspired"? Leonardo Da Vinci, when he painted, well, he was inspired by his subjects. He was going to do something else, or paint someone else, when he was inspired by a woman, and we have Mona Lisa. That's what we think of as inspiration, something out of the blue. A great chef sees some tableau in nature that inspires a presentation of a particular dish. That's inspiration. I have seen or heard, in the last week alone, three different products telling me they were "inspired" by something. Well, no. They were going to make a product, and some stupid copywriter on Madison Avenue barfed up some trite phrase to sell it, that we weren't supposed to think about, but just let it drift through our subconscious. I'm not inspired. I just want a cup of coffee. For those of you watching the Winter Olympics, I'm sure you have your own way of dealing with the fact that they compete while we sleep, and vice versa. NBC, the broadcast network that has the rights this year, has cleverly arranged it so that the highest rated events (all of which involve figure skating) start at the weird local hour of 10:00 AM in Korea, so that they will start at 8:00 PM Eastern Time for the American audience, who pays the bills. Other than that, however, the events are presented in a combination of live and on tape, with most of the live broadcasts being overnight. So a lot of us, we assume, simply set our DVRs to record everything that says "Olympics" in the title, and fast forward through the biathlon and the cross-country skiing to get to what we really want to see. That would be, of course, curling, in this case Mixed Doubles Curling, a very recent event in what has been often called, very unfairly, "shuffleboard on ice." I needn't take time to explain curling, since you surely have seen it, if not actually watched it intently. Round stones are slid down the ice to a series of circles, and ... well, maybe it is shuffleboard on ice. Most of the countries' team coaches are Canadians, including the Team USA coach, which tells you everything you need to know about curling. We love watching it in this house, and quickly find ourselves using curling terms while watching, that we then set aside for four years. "That's shot rock there!" "They've got a shot for a double!" So ... the USA mixed doubles team is a brother-sister combination from Wisconsin, Matt and Becca Hamilton. They are "interesting" because they talk to each other like siblings would, as opposed to teammates, so there is that. Matt has a mustache and often a baseball cap of some kind, and is stocky enough that if I say "beer-league softball", you'll get the idea. And they're very good, enough to be the Team USA mixed doubles competitors. Plus, Matt Hamilton sounds exactly like the guy who played the big boss on the Christmas Vacation movie. I can't be the only one who hears that. Of course, this is 2018, so there has been a lot of coverage on social media, and the Hamilton siblings (or "HamFam", since we have to have that these days), being so often on TV in the early goings of these Games, are media darlings. That's pretty cool, and certainly good for curling, if being good for curling is a good thing in general. Being media darlings, they were the subject of a fair number of interviews from the USA-based media, particularly those from NBC. One of those interviews, which I did not actually see (I generally fast-forward past interviews and "up close and personal" feature pieces, same as commercials), was done with Katie Couric, who is a celebrity at NBC News. In fairness, I don't know what she does there, because I don't watch (or trust) NBC News, but she has been around a long time, back from when no sentence invoking her name would be said without "perky" in there somewhere. Now, of course, she is a long-time veteran of reading news. What that makes her, of course, is up for debate, since NBC is not exactly known for journalistic integrity. But she is at least famous. At any rate, some time after she interviewed the Hamiltons, the Team USA siblings were competing in one of their many matches, which the best girl and I were watching. Between shots, or maybe in a break between ends (think "innings"), the curling play-by-play folks threw it back to their NBC Olympics headquarters to kill a minute or two. The host there -- and I can't recall who -- mentioned the interview that Katie Couric had with the Hamiltons. Now at this point, the social media hype for them was pretty widespread. So the host said, in so many words, that Miss Couric was really excited to talk to the Hamiltons, even more so than they seemingly were, to talk to her. That was surprising, the host said, because they should have been enraptured at meeting The Katie Couric, Major Media Star. I'm not kidding. He actually said, and I'm sorry I don't recall the exact words, that they should have been really honored because this was, after all, Katie Couric. I turned to my best girl and asked if she had heard the same tone that I had. Yep, she said. It was all about Katie Couric. I could not believe that the people at NBC thought that Katie Couric was so important that Olympic athletes in the midst of their competition run should grovel at her presence. So let me provide a message to NBC News. Do you know what is important? Let me try to explain. - What happened is important. Who reads the words is not. - The scores and the action are important. What network brought them to us is not. - Matt and Becca Hamilton are important. Katie Couric, whatever you may think, is not. This is a lesson that will be hard for NBC, who pays Miss Couric boatloads of money to read the news, to have to learn. If this had not happened, by a week after the Olympics surely I would have completely forgotten what network broadcast the Games. But I will send this piece to them, in the hopes that at least someday they will get it. Yesterday afternoon I was oh, so deeply saddened to learn of a tragic blot, nay, a substantial stain on the escutcheon of my once-beloved alma mater, the Massachusetts Institute of Technology. I barely know how to describe my horror myself, so let me go ahead and provide the context. We alumni received an email from L. Rafael Reif, the president of MIT. At MIT, we face facts, and we turn passionately toward the future. Today, however, we must attend to some newly uncovered facts from our past. A distinguished member of our history faculty, Professor Craig Steven Wilder is the leading authority on how the emergence and growth of American colleges and universities is entwined with the history of slavery. Last spring, I sought Craig's advice on how MIT could best explore its historical connections in this realm. Based on our conversation, [we elected] to develop an ongoing undergraduate primary-research course, to be called "MIT and Slavery." Led by Professor Wilder and MIT's archivist for researcher services Nora Murphy, the class began last fall, meeting in the MIT archives. In December, the students presented to me what they have discovered so far. Already, they have uncovered a range of evidence showing how MIT's early decades were shaped by the post-Civil War process of reconstruction, from MIT-trained engineers rebuilding the South's war-torn railroads to our links to many industries, from mining to textiles, that had depended directly or indirectly on labor from enslaved people. The students also found evidence of how the ugly racial attitudes of the day played out in student publications and even aspects of the curriculum. Perhaps the most jarring finding: an 1850 Virginia census document, which shows that before [MIT founder] William Barton Rogers moved to Boston to found MIT, he and his wife, Emma, held six human beings as slaves. I have already seen a range of reactions to and feelings about this news ... I am certain that we have nothing to fear from examining our past; understanding it better can only make us wiser. I have already learned a great deal from listening to other people's perspectives on the findings, and I look forward to our reflecting on this new knowledge as a community. In the 157 years since MIT's founding, we have often celebrated William Barton Rogers for his creative vision as an educator and his tenacity in pushing to establish MIT. With this new evidence, and our ongoing commitment to learn more about the links between the institution of slavery and technical institutions like MIT, today we must start thinking together about how to tell a more complete version of our history. Are they serious? I mean, if some history major -- and they only "sort of" have a History Department there, not the same way liberal-arts schools do -- wanted to do a master's thesis on that stuff, I suppose that would be OK. But what did anyone think the outcome of this effort was going to be? More importantly, before 1863, in half the nation slavery was, in fact, legal. It wasn't good, mind you, but it was legal. So the fact that W. B. Rogers, the founder of MIT in 1861, owned "six human beings as slaves", may make the ownership contemptible by 2018 standards, but it was not only common but perfectly legal at the time. Good men actually owned slaves, Dr. Reif; it is only the left that insists that we apply contemporary morality to people 200 years since, and tear down their monuments as if they never did any good. Across the main entrance to the Institute, at 77 Mass. Ave. in Cambridge, Massachusetts, the very old stone I walked under in the 1960s and 1970s has etched under the university name, the words "WILLIAM BARTON ROGERS, FOVNDER", in the old-style rendering. That, friends, is a monument to the single action of Dr. Rogers that actually is relevant to MIT -- whatever he did or didn't do prior to coming to Greater Boston is not, despite what Dr. Reif says, part of telling a "more complete version of our history" but part of his. I do not know what it says about my alma mater that, not only did they find it necessary to do all this inane research as a historical project, but that they felt the need to disseminate it in the email above, as if it actually matters to alumni. The mission of MIT in 2018 has nothing whatsoever to do with whether or not a guy before MIT was founded -- OK, "fovnded" -- held slaves, as was legal to do at the time he did. I want to hear that they're doing hot-spit research up there, and our professors are uncovering the secrets of the universe, and developing technology that advances our lives and collective knowledge, building great buildings and infrastructure, curing disease and enhancing life. That, friends, is worth an email to the troops. Whether the Institute's founder held slaves years before coming to Boston, or beat his wife, or spanked his son, or stepped on a cockroach before MIT was a gleam in his eye, well, that may interest you, but I couldn't care less. Worst of all -- What do they propose to do with this information? Do you think the left -- and this is a university campus, remember -- is going to let them just document all that and move on? Yeah, sure they will. I guarantee you that before the end of the year, either that inscription in stone is jack-hammered off the face of the entrance, or there will at the least have been a huge movement by Antifa to make that happen. And we can thank the idiocy of those who think that it was a really, really good idea to do all that at a university level. But I will probably take my diploma down from the wall if they do. And as if I even have to say it, I think slavery was really bad, too. But that's my born-in-1951 morality. The "midterm elections" are the ones held, of course, in the off-even years, when there is no presidential election, but all the House members and a third of the Senators are elected. Since a midterm takes place two years after a new president takes office, it is invariably assumed to be a referendum of some kind on the new president and his accomplishments. We must hate our new presidents, then, because the party of the president almost invariably loses House seats, a couple dozen on average, and it is typically regarded as a reaction to the policies of the president. This midterm is not like previous midterms. Now, the Democrats don't think that, or at least aren't saying that. They think they can pick up a majority in the House and seats in the Senate that might give them the majority there, too. They look at the history of past midterms after a change in the White House and take heart. But not so fast, folks. Two of the biggest midterm shellackings of a president, to use Barack Obama's words, have taken place in fairly recent memory. These were in 1994, two years after Bill Clinton was elected, and 2010, two years after Obama became president. In case you have forgotten, in 1994, under the leadership of Newt Gingrich, Republicans defeated enough House Democrats to take a majority in the House, for the first time since maybe 1872 or so. It seemed like 1872, anyway. They defeated, in their own districts, the Speaker of the House (Tom Foley) and several committee chairmen, powerful people made to look like the problems they were. Then in 2010, the Democrats lost their grip on the House and their filibuster-proof majority in the Senate, Nancy Pelosi lost her speakership (though not her safe seat), and the USA was protected from whatever an unchecked Obama was going to do to it if he had Congress another couple years. How might 2018 be different from 1994 and 2010? Well, let's take a look at those years and test the climate of the nation. In 1994, Bill Clinton was the new president, an he had made the God-awful mistake of turning the issue of health insurance over to his wife, the unelected Hillary Clinton. What she came up with was socialized medicine of a kind that never got off the ground, and tarred Bill so badly that he lost the House the next year in 1994. The Democrats were out-strategized by Newt Gingrich that year, who brought out his Contract with America, pledging such nation-friendly proposals as term limits, a balanced budget and tax reform. The Democrats had Hillary, and that lost badly. To his credit, Clinton then figured out that he could get reelected himself only by working with the Republicans, and they were successful together. In 2010, we had a new president again. However, he decided that, ignoring the lesson of 1994, he too was going to do a health insurance overhaul, and had an even bigger congressional majority to shove through what he wanted to foist on the USA. This time, though, it was passed, and we immediately recognized that all the promises -- "You can keep your plan", "You can keep your doctor" -- were bogus and intentional lies. Again, then, in 2010 congressional leadership was flipped, and Obama was stopped from shoving more legislation down our throats. He then turned to Executive Orders to carry out his dictates, and continued adding stifling regulations to business, resulting in stagnant, low economic growth of the type that eventually got Donald Trump elected president. But 2018 is not the same thing. The Democrats, for one thing, do not have a Newt Gingrich on their side. Gingrich not only found outcomes that the nation wanted, he proposed concrete, legislative actions that he pledged the Republicans to press forward with. He noted the problems, identified tangible laws to add or change, and won in 1994. The Democrats not only don't have a Gingrich, they don't have ideas to share even if they had one. Having just come off eight years of Obama, and a terrible result with a dead economy, allies mistrusting us and enemies not fearing us, President Trump was supposed to address that. The thing is, he did. After the tax cut he pressed for, millions of Americans were given cash bonuses by their employers, and tens of millions are, this month, receiving bigger paychecks based on lower tax rates. Obamacare, on the other hand, had an immediately harmful impact, that continues to cost Americans today. The tax cuts had an immediately positive impact, that will continue indefinitely. Americans can look out at our international standing and see that we have stronger allies who actually trust us. ISIS has been militarily battered and holds almost no territory, although their ideology has not been destroyed yet. Despite the program trading-driven weirdness in the stock market last week, anyone with a 401(k) is substantially better off today than a year ago, not because of Obama-era interest rate manipulation, but because businesses are more healthy. Unlike 1994 and 2010, the results of the work of the president's party have been positive for the economy and elsewhere, and it is after all the economy, stupid. The Democrats can't win back the Senate, simply because the math is not in their favor -- far more Democrats in red states are up for reelection than vice versa -- but hypothetically the House is always up for grabs, especially given a large number of retiring Republicans. However, unless the Democrats come up with an agenda, they're spitting in the wind in their faces. Unless they can explain why not one of them voted for the tax cut package, and they come up with a good reason (hint: there is not one), they're going to have a hard time selling their story. Unless they can come up with someone better than the laughable Nancy Pelosi to tell their story, there's only one outcome. The 2018 midterms are not going to hurt the Republicans. One bit. It's Friday, and I've recently taken to saving the lightest questions and topics for the end of the week, but today there was a topic I wanted to take up ... and not wait. One attribute of "The Swamp", that we have been discovering since the beginning of the Trump Administration, is the layering of political appointees over the top of the career employees in the Federal government. Specifically, it is the concept that a new president comes in, fires the old leadership and puts his own in place. In fact, it is necessary, in order to do the bidding of the people, that an incoming president gets to stamp the leadership of Federal agencies with his own policies. It is counter to that concept, when a president's first week in office still features holdovers from a previous administration, especially when, as we have with Trump v. Obama, the previous administration's policies being diametrically opposed to the new president. How are the new leaders appointed? Well, they have to be nominated and then subject to hearings and debate by the Senate in their "advise and consent" role. And that, friends, is the problem. Let me quote myself from Wednesday's column here: "Those people [agency leaders] change with the changes in administration. What should happen, in a perfect world, is that those layers resign en masse on Inauguration Day and a whole new set of people, brought in by the President's team, take over at that point, in an interim status subject to Senate approval but already in their jobs, and the career people underneath those levels (e.g., career FBI agents), carry on their duties with new leadership." Why is that not the case? Why does the president not simply fire the whole mess of his predecessors' leadership, appoint his own people as interim occupiers of their positions, and then give the Senate six months to vote them up or down? Specifically -- what Constitutional clause would be violated by a president doing just that? Clearly he can fire the lot of them, the previous leadership. We know that. But why is it assumed that he can't just appoint his own intended people as "interim" on day one, and get them running immediately? I would adore it if a legal mind familiar with all that could weigh in on this. Right now, we are still, a year down the line, suffering because the Democrats have slowed the process of Senate approval, insisting on the full 30 hours for each of the hundreds and hundreds of political appointees. I can't imagine why it would not be legally possible to circumvent that by doing all interim appointments while Senate processes slogged on. I would adore it more if a president -- and President Trump is just the guy to do it -- would simply fire the holdovers, appoint people, move them into the offices, and then let them keep their "interim" title with all the power of the office, awaiting Senate confirmation when they got around to it -- but without allowing the Comeys, Strzoks and Pages of the previous administration to keep their hands on any of the levers of government. Do you know why that wouldn't be perfectly reasonable? I would like to believe that if he were to make such appointments, and the opposition (Senate Democrats) sued to stop it, the Supreme Court would ultimately determine that the president had the right to make interim appointments, pending Senate approval for permanent status. Input from Constitutional scholars welcome. I'm here. I sometimes listen to White House press conferences and daily briefings, as conducted by Sarah Sanders, the current Press Secretary. Generally, for most of the press corps, I listen with trepidation as they start their questions, since I know they are going to be about anything but the positives in the economy, international relations and the military, brought by our current president. But I hadn't really crystallized, in my mind, exactly what they were doing in the way they asked questions that bugged me so much. But then today, well, I think I got it figured. The bulk of the briefing was actually not done by Mrs. Sanders but, rather, by a senior representative from the FBI who was there to take questions as a follow-up to the recent focus by President Trump on stopping the MS-13 gang. The president had been talking a lot about it, so the White House asked the gentleman to come over for much of the briefing and take questions. Mrs. Sanders took over a bit later and did take some questions. As she did, I started to listen to the questions and the way they were structured, and I finally figured it out. Do you remember "strawmen"? That was a favorite tactic of Barack Obama, the now mercifully-former president. He would make some kind of point by saying something that no one had actually said, described it as the position of the Republicans, and then tried to argue with it. It was frustrating that the press never took him to task for doing that, because it is so intellectually corrupt. But then again, so are the media, for the most part, so it is no surprise that they not challenge their patron Saint Barry, who, it should be pointed out, didn't exactly make himself available to the press all that much. At any rate, I was starting to see that the press, in asking their questions, were repeatedly doing their own version of a strawman. They would say that the president had said or done this or that, and then ask if that was going to accomplish something that the statement had nothing to do with. Case in point -- and I rewound the tape to make sure I had this exactly right. A few days back, President Trump had made an off-the-cuff remark to the effect that a government shutdown might be a good thing, if the Democrats can't go ahead and sign on to the current budget deal -- to which, it should be pointed out, they don't object. He was saying that a shutdown might expose the Democrats to more of the criticism they finally started getting when Chuck Schumer caused the Federal shutdown last week. "On the economy and the shutdown ... How is a shutdown, that the president wants basically to show Democrats that they were wrong, [how is it] going to help the economy and help those the president says he wants to lift [from their situation]?" Now, it is absolutely the case that the president was saying that a shutdown, if it happened, could be a good thing, but it was because it would point out that the Democrats don't actually want to help govern, but simply want to stall and block anything from happening. But listen to the words. "How is a shutdown going to help the economy?" What a contemptible strawman question! Shutdowns are not done to "help the economy"; in fact, they are an outcome (of inaction) rather than a proactive stance. So no one is trying to shut the government down. Certainly they are not done to help the economy, of course. In fact, they have nothing to do with the economy and, since everyone is made whole thereafter, no one gains or loses on a shutdown. But more importantly, the intent of a shutdown is not to have an impact on the economy! A shutdown has nothing to do with "those the president s trying to lift up", and has no impact on them April Ryan knows that, like you and I. So why did she ask it that way? Why did she not ask the more reasonable question -- "Why did the president say that a shutdown would be a good thing?" That would have been reasonable to ask, and Mrs. Sanders would have had to have addressed it and explained the president's position. But no, April Ryan just couldn't help herself. Why? Because her purpose was not to get an answer but to embarrass the Press Secretary, the President and the Administration. She knows it, and so do you and I. And that's why there is fake news, and why it's great that the press is getting exposed for who they are. Depending on what media outlet you use to get your news these days, you may likely have come across the term "boots and suits." If you are not someone who spent 36 years living within 60 miles of Washington, DC, the term may not be all that familiar to you -- at least not in its current context. So let me help you, and perhaps explain yet another area where the media are failing those who rely upon it to understand what's going on. The basic difference between "boots" and "suits" has to do with the construct of Federal agencies and departments, like the Department of State, the Federal Communications Commission, and the Agency for Seeing What Happens When Shrimp Are Put on a Treadmill. The work that they do on a daily basis is, at least sometimes, valuable and more importantly, ongoing. Since it is ongoing, you have the inherent battle between the need for things like continuity and institutional knowledge, and the need for the President, to whom all agencies report, to have them doing what his policy mandates that they do. So the leadership in the agency is made up of what are called "political appointees", and they range from Cabinet secretaries down a couple levels to assistant secretaries, undersecretaries and deputy undersecretaries, the odd titles for people who run big parts of those agencies. Those people change with the changes in administration. What should happen, in a perfect world, is that those layers resign en masse on Inauguration Day and a whole new set of people, brought in by the President's team, take over at that point, in an interim status subject to Senate approval but already in their jobs, and the career people underneath those levels (e.g., career FBI agents), carry on their duties with new leadership. But it's not a perfect world. And I'll get to that. What the system creates are these two levels -- the career people underneath, who do their jobs for many years and try to advance in the system, and the senior executives, who are political appointees and who should disappear on a change of administration. The senior executives -- the "suits" -- apply the political layer and the desires of the president over top of what the career people then do. Now, we are not denigrating the work of the "suits", who also often work long hours on behalf of the nation; nor are we overstating the contribution of the "boots", who, along with critical border security officers and researchers at NIH and CDC, include IRS auditors and those bureaucrats who do things like, you know, add regulations for their own sake. But it is vital that we understand that the upper levels of management in every agency may have a very different goal from those below them. And let us also point out at this moment that those "suits" don't resign en masse on Inauguration Day. That's why Sally Yates, the Obama appointee who was an Assistant Attorney General, took over the Justice Department (when Loretta Lynch did indeed resign at the end of Obama's term), and stayed on as interim Attorney General, leaving Donald Trump to start his term as president having an Attorney General who was diametrically opposed to his policies! So understanding all that, we return to the corruption at the FBI. And the media. The left and the media (but I repeat myself) have their talking points. A big one before, during and now after the release of the House memo exposing the corrupt FISA application by "the FBI" (as distinct, in their minds, from the specific people like Comey, McCabe, Strzok and Page) has been that the House Intelligence Committee and President Trump are trying to "damage the FBI" and are at war "against the FBI"). This is where the media are at their own most corrupt. By not pointing out that the FBI, like all Federal agencies, has a layer of political types imposed over the rank and file, they are claiming that the president is trying to smear "the FBI" to mean, by extension, the rank and file agents. Which, of course, he is absolutely not doing. He is pointing out that bad apples, even in the FBI, can put at risk the freedoms of innocent civilians. Processes like the FISA warrant system are fragile in the hands of political suits, especially holdovers yet to be replaced in a new administration. The media do not point that out, because they have their own agenda, and I want to mention this. The long and storied history of the media of the USA includes a diligent desire to expose scandal. Watergate? "We have got to know everything" ... what did Nixon know and when did he know it. Pentagon papers? The public absolutely needs to know, right? FBI leadership (the suits) uses a faked dossier to obtain a surveillance warrant on an American citizen, as an excuse to spy on the campaign of a major party candidate, with written and electronic evidence of that corruption? Crickets. When the media say anything, it is to claim that the FBI's reputation is being besmirched. Boots are not suits. But the media will not tell you that.